When did we learn to trust e-mail? Sherri Greenbach was an executive in the Development Division at UJA-Federation in 1994 and 1995. She may have worked at UJA-Federation longer than these 2 years but just one box of her files has become part of the the archives project. 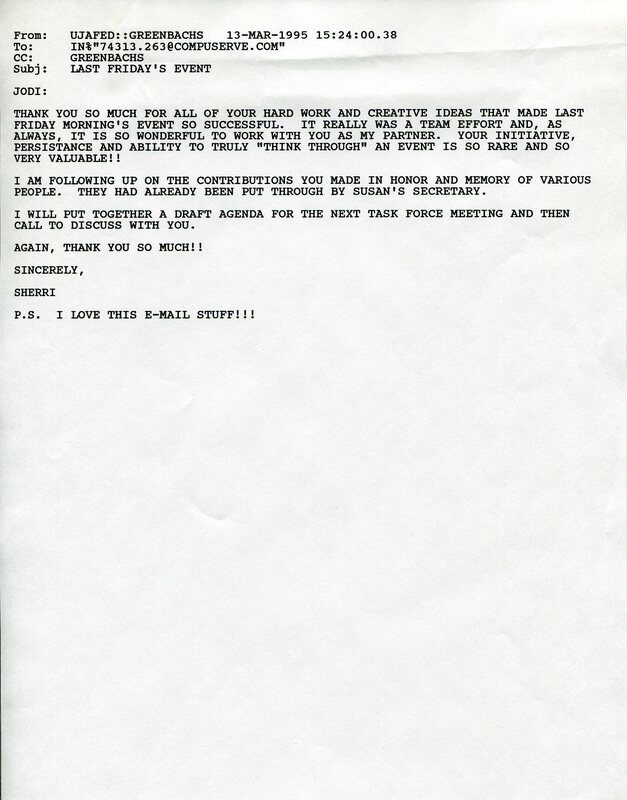 These files document Sherri’s work planning fundraising events for the Women’s Division campaign. It appears that Sherri was primarily involved in fundraising with the Lawyer’s Division, but none of those files have surfaced to date. In her work on the Women’s Division campaign during this time, Sherri corresponded regularly with Jodi Schwartz, a lay leader involved with a particular event in March of 1995. In addition to details of these fundraising events in Sherri’s files, it is also possible to identify the moment a new technology was taking hold in the UJA-Federation offices. This document is a fax cover sheet from March 7th …. 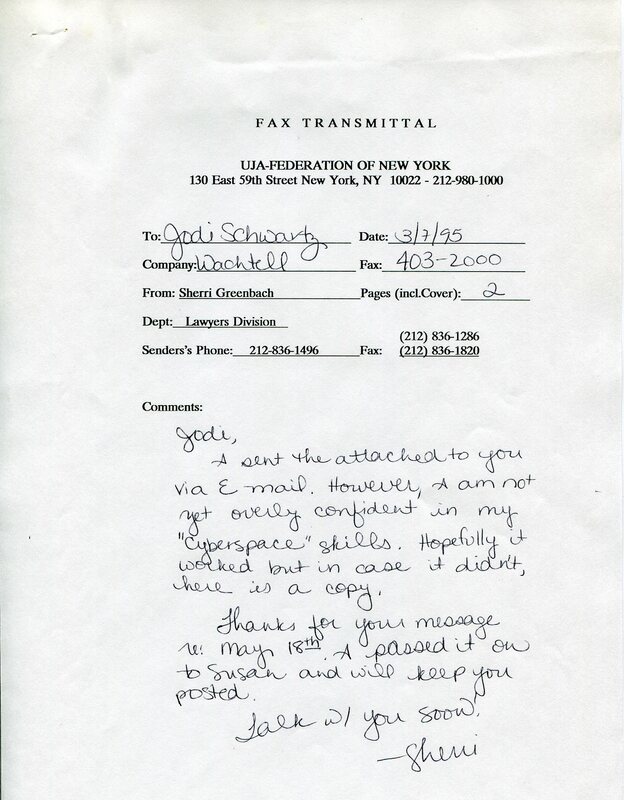 The adoption of e-mail in place of faxing brings to mind Heather’s December post on Federation’s early work on their own website, in 1998. Technology began to change rapidly in the late 1990s as more of our documentation was created in electronic form only. Questions of what have we may have lost come to mind. In moving to e-mail and electronic communication, does it matter that we will no longer see someone’s handwriting on a fax? Or doodles on pages of notes or meeting agendas? Have we lost anything of value, as long as we are able to preserve and maintain and continue to access the content itself? Are we sure, yet, that we will be able to preserve, maintain and continue to access the electronic files we depend on? Digital archivists are hard at work figuring out best practices to make sure that people interested in researching post-2000 files will in fact be able to do so. The files related to Project Renewal, a program of the UJA-Federation Joint Campaign to raise funds to preserve and revitalize neighborhoods in New York City and Israel, are processed and available to researchers. 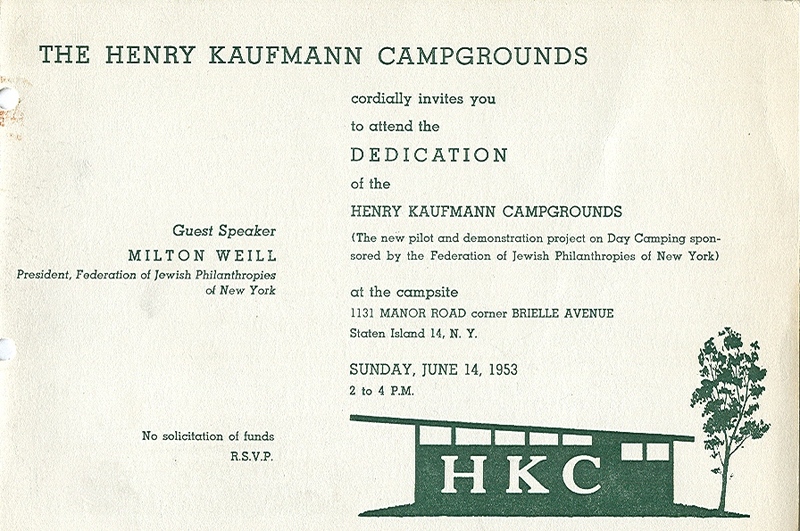 The processed material falls into two different groups of archival material, based on geographical location, Federation of Jewish Philanthropies coordinated and distributed funds related to Project Renewal in New York City, whereas, the Joint Campaign (with staff and support from United Jewish Appeal of Greater New York) oversaw Project Renewal in Israel. Within the Federation files related to Project Renewal, there are the files of Joseph Langer, the director of Project Renewal/Neighborhood Preservation (approximately 1978-1984) and later Community Development department (1984-1994). 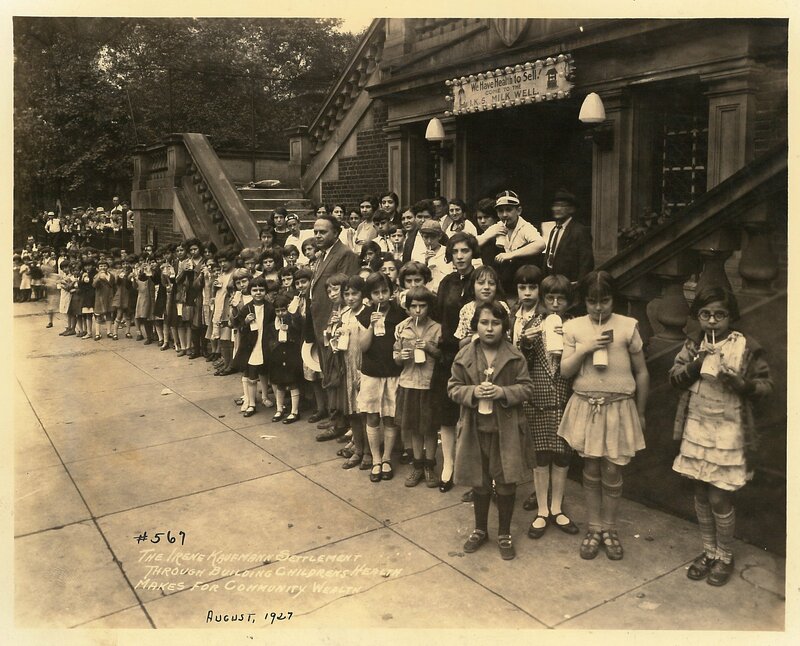 Langer’s material documents Federation’s activities in the New York metropolitan area to revitalize and encourage Jewish residents to move to neighborhoods like Pelham Parkway in the Bronx or Jackson Heights in Queens. 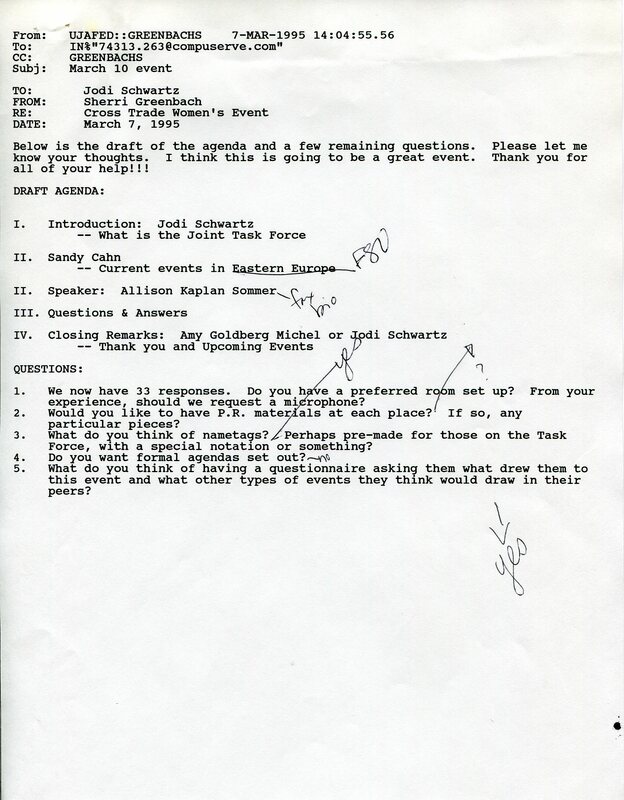 In the Joint Campaign files related to Project Renewal, there are the files of Lucille Strauss, the coordinator then director of Project Renewal for the Joint Campaign (approximately 1978-1983). Among other subjects, her files highlight the beginning of the Joint Campaign’s efforts to develop programs and services in the Tel Aviv neighborhood, Hatikvah. It is always nice to find a tacit reminder of the value of archives to an institution as well as to researchers. Mixed in with Strauss’s files, there was a folder that contained correspondence to Colonel Seymour Pomrenze, Federation’s records manager and archives consultant, requesting that he locate archived records related to Project Renewal in Hatikvah. A potential donor was interested to discover and, likely, compare Hatikvah area at the beginning of the Project Renewal’s efforts in the early 1980s with its current condition in 1997. 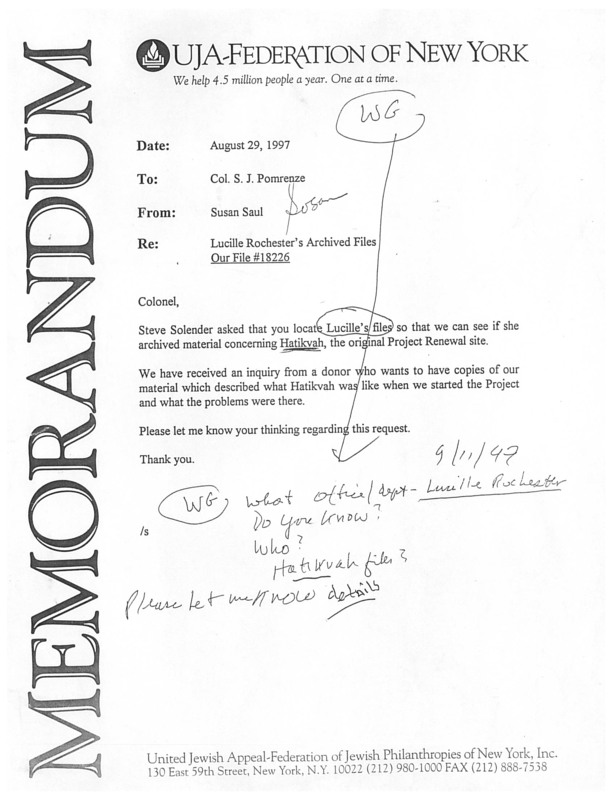 Information on Project Renewal in Hatikvah like this file–including reports, needs-based analysis, fundraising coordination, and printed material–could be found and retrieved, since Colonel Pomrenze had some intellectual control over the philanthropic institution’s records. 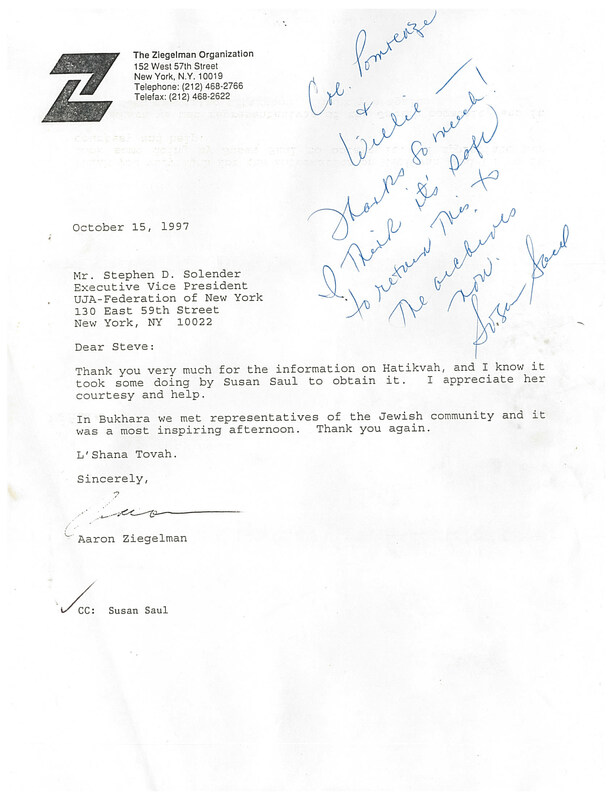 The potential donor later thanked Stephen Solender, UJA-Federation Executive Vice President until 1999, for locating the information on Hatikvah found in the UJA-Federation records. 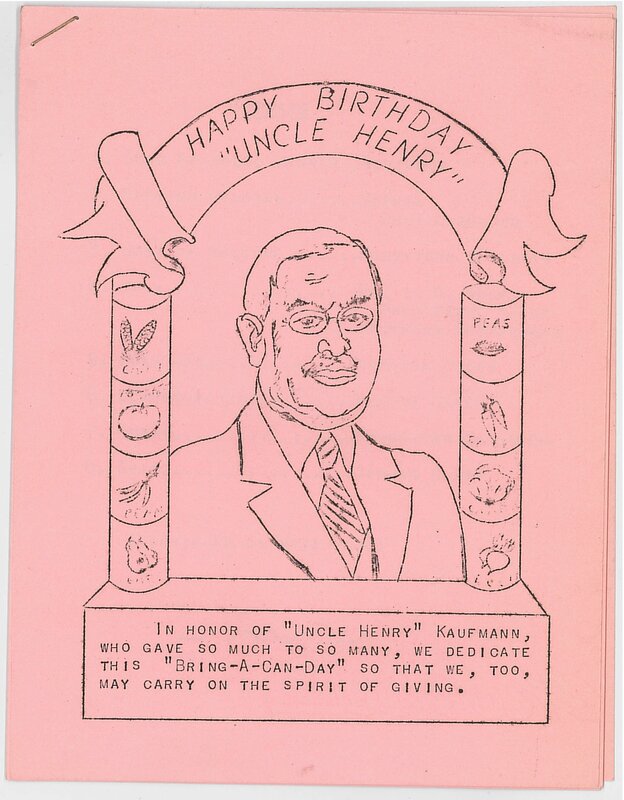 The Project Renewal records were located, retrieved, shared with the donor, and then returned to offsite storage, where records like these and many, many others would be processed, arranged, described, preserved, and incorporated into the ongoing UJA-Federation of New York Archives Project.